N 52° 35' 52.8" W 007° 43' 59.6"
In this timber fence there are three grave slabs, a fragment of another grave marker and a strange block of stone. Inside a timber fence there are three grave slabs, a shorter block of stone and a stone with a hollow on one side, which have some history. According to the folklore this should the burial place of Gobán Saor, the legendary famous stonemason and builder who lived around 600 AD. It is said that his skill was unequalled and that kings and future saints had requested his work to make their castle and churches unique. He was active mainly in county Tipperary. Among many stories and legends that I have read about him there's one that I love the most. It goes that one day Gobán Saor was wandering and looking for a job so he saw a church being built and asked the site master if they needed a worker and he asked Gobán what he was able to do, and to test him he asked him to carve a cat with two tails out of a block of stone while the other men stopped for lunch, because nobody could carve something like that in such a short time. And so he did. When they finished their lunch the stone was finely carved with a cat with two tails. When we visited Donaghmore church the informative sign read that the tympanum above the doorway once was adorned by a slab depicting a cat with two tails. That church is less than 8 kilometres northeast from here. So it seems that some of the legends can be true. The slabs inside this timber fence are of different sizes. The largest grave slab measures 2.07 metres in length, 40 centimetres in width and is 15 centimetres thick. It's broken in two segments, with the longer segment being two thirds of the total length. The upper part of the stone has what appears to be a human head with a long neck. The lower part has two rounded items that I think are two feet. Between the head and feet are some weird decorations. A long double line joins the head with the feet, but below the head there's something that looks like a smiling small round face into a small round hollow. It is said that this is the tomb of Gobán Saor himself. A second grave slab is to the north of the first one. It measures 1.13 metres of length, 34 centimetres of width and 6 centimetres of thickness. This one is broke into four pieces. The upper part has a low bump on its surface, it might have been a carved head, but now it's completely unrecognisable. The rest of the slab has no other visible features. The third grave slab is to the east of the second one. It is 1.01 metres long, 56 centimetres wide and 6 centimetres thick. It is broken in two. The short upper segment seems to have two carved heads, though one is very worn. There's a short block of slab next to the third one, which is just 33 centimetres long, 21 centimetres wide and 7 centimetres thick. This could have been part of another grave slab, but nothing else of it survives. All these grave slabs have their upper end towards the west (280°). 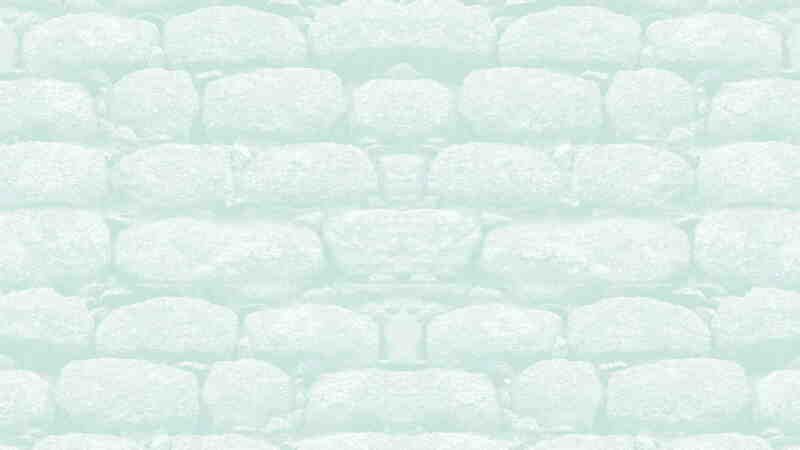 Another stone block is roughly triangle shaped and on its south face it has a hollow shaped like a shield. This hollow has a Greek cross carved in bas-relief which measure 20 centimetres. 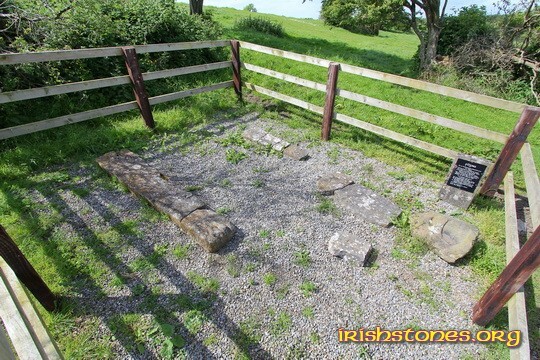 At 78 metres to the southwest (210°) from these slabs there is Derrynaflan church. The site is on a low hill in the middle of a bogland, where Bord na Móna cuts turf. Access to this site can be very difficult. There are two only routes that I know of. We took the longest one. From our car we walked for 35 minutes and 2.49 kilometres on a clear path for the first kilometre and on the hint of a path and among bushes and trees for the remaining part of the trip. Horses can be your companions during the long walk. Wear apt footwear.